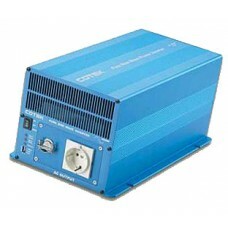 The SK3000 Cotek sinus-converter transforms dc-bus of solar modules into pure single-phase alternating current. It is specifically suitable for solar installations. High frequency PWM technology ensures a compact unit providing high reliability and performance. The inverter is quiet and portable. It can therefore be operated in almost any environment. The Cotek sinus-converters are convenient for high resistive load. Thus they are conductive for the sensible requests of electronic devices and support the long lasting existence. There is an additional electronic protection which supports the efficiency of the converter in continuous operation. Suitable for traffic systems, mobile home, boat, cottage, solar energy, emergency home energy. * Pure sinus wave to protect your converter – no damage-risk.